We all have two kinds of friends, those who ‘get’ the crafting thing, and those who don’t, and many of us would need to differentiate between the two when Christmas gifts are considered. So this week’s post is aimed at those friends who ‘get it’, who would enjoy and treasure something that you made, because they appreciate the thought and effort that when into it – because you made it. Following on from Lou’s amazing advent calendar earlier this week, which was also a ‘scrappy friend gift’ Lou created this beautiful mini album. She so loves to create with wood products and embellishments, and this album by Pink Paislee is no exception. Wood is such a versatile product and the ideas for altering it are limitless :). Georgia and her sister both recently bought Thermomix machines and have been having fun swapping recipes. For Christmas, Georgia decided to create a recipe stand for her sister to keep all of those new recipes within arm's reach. 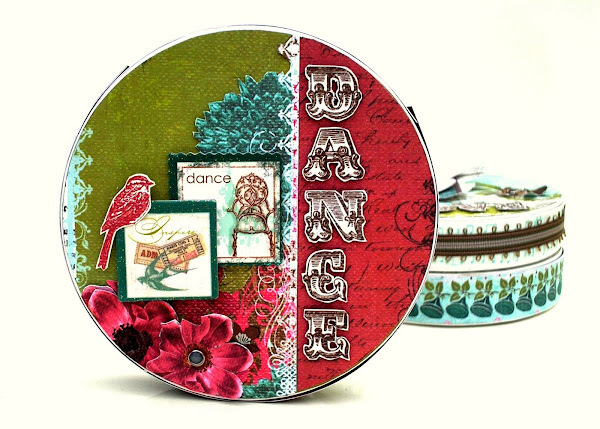 Georgia used a 7Gypsies Revolving Photo Carousel and as a holder for all her BasicGrey Picadilly pages, just waiting for new recipe ideas. 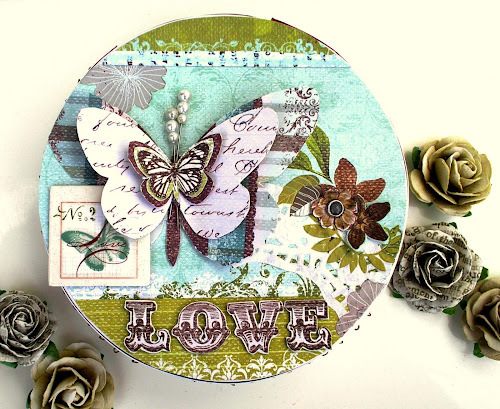 We loved many projects that we found on Sandy Ang’s blog not least of which is this gorgeous needle holder, created with Sassafras Papers and Websters Whimsies. It would make a beautiful and thoughtful gift for any sewer or scrapper, and would also be quick enough to do several at once in a production line. 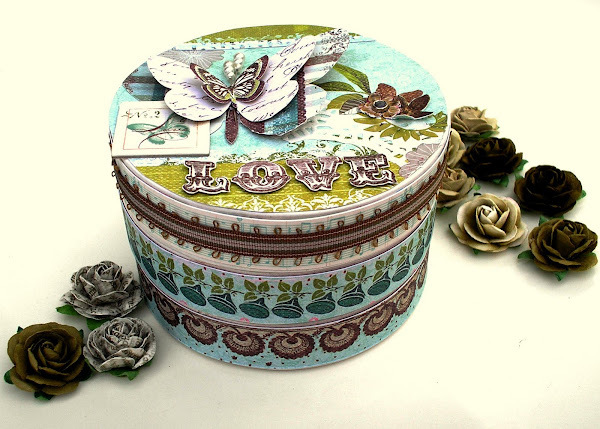 We also fell in love with these embellished Prima boxes on Sandy’s blog, though they were designed to contain gifts for bridesmaids, they would make a beautiful and thoughtful gift for a fellow crafter either empty as a storage offering, or perhaps filled with flowers or other embellishments. Sandy, thank you for allowing us to showcase your wonderful ideas. This insanely beautiful project was created by Rachel Tucker from a recycled chocolate box, Prima flowers, papers and Pebbles. She designed it for Valentine’s Day but truly, who wouldn’t love to receive something like this for Christmas, or indeed, any day of the year?! Rachel calls them ‘sweet nothings’ as there are no calorie-laden choccies inside, just sweet notes and flowers. This piece of wall art would make a wonderful gift for a scrappy/arty friend. Kathy Wade has created this home decor item using the Silhouette machine as well as a leaf die cut and several different pieces of Basic Grey paper from the Indian Summer and Green at Heart ranges. The letter stickers are also from Basic Grey and the stamped letters from Hero Arts. This would look fabulous hanging in a friends craft room. Many thanks Kathy. Finally, we thank Karola Witczak for allowing us to share this gem we found on the Pink Paislee blog. It’s a wooden shadowbox frame, that she has shabbied up with corrugated cardboard, white paint and Pink Paislee’s beautiful Butterfly Garden range. Next week we’ll take a look at handmade gift solutions for those friends who might not necessarily ‘get’ these more elaborate crafty gifts, but would still appreciate something that you’ve taken the time and effort to create. If you have made anything that you think would fit this category, we’d love to see and share it.